I am new to SO, and I have asked about 5 questions so far. I have uploaded images of my code on most of my questions. On two separate occasions two different users advised me not to upload images of code and outputs. One even jokingly said that every time an image of code is uploaded a kitten somewhere dies. Now why is uploading images of code on SO such a big "no no"? Isn't that what the images tab on SO is there for? And what other options do I have if I want to show my code to everyone, so that they can have a better understanding of what I am explaining? Code or sample data in images can't be copied and pasted into an editor and compiled in order to reproduce the problem. Images are large and hard to read on mobile devices, and often cost mobile users valuable data that is limited. Images can't be searched and therefore aren't useful to future readers. Images are harder to read than text. Posting images of your code is more difficult than copying/pasting the actual code and formatting it. You're asking us to volunteer our time for free to solve your problem, and you should make it as easy as possible for us to do so. Images cannot be interpreted by screen readers for those with visual impairments. Images show a limited number of lines of code. For moderately complex questions, you cannot fit all of the required code on a single screen even when you have created the most minimal example possible to reproduce the issue at hand. Others can't help improve your question by fixing your code formatting. 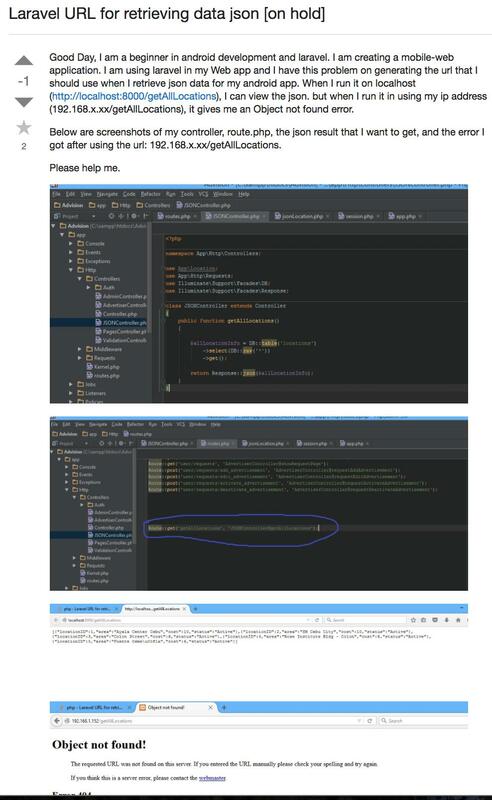 Others can't see if an error in your code is caused by, say, invisible characters or misuse of unicode characters that look the same (like this: stackoverflow.com/q/9246051). Images should only be used to illustrate problems that can't be made clear in any other way. The first reason is that links to images fail. The second reason is that text on images is not searchable. The third reason is that it gives you an incentive 'not to try'; simply show us a screenshot of your code and call it a day. A screenshot of code is not acceptable by itself; you should include the code as well. Because it's completely and utterly pointless. It's wasting other people's bandwidth for something considerably less legible than the original code, which is perfectly copy/paste-able as text. It also prevents respondents from copy/pasting the code into their own IDEs, which is exactly what you don't want to discourage. Unless the code is extremely short and perfectly formatted, I don't look at in the SO display. I copy-paste it into an IDE, where I can more conveniently view and search it, in a nice big window with syntax highlighting I like. Unfortunately, copy-pasting an image of some code into an IDE does not work so well. The screenshots with code are not advised, because the code is not copyable, searchable (doesn't help further users to find it) and it's not self-contained. For example, when the link to the screenshot is gone (and it happens quite often), your question wouldn't make any sense for further readers. Having screenshot instead of code, doesn't help people who're trying to help you, because they've to spend their extra time re-typing the code in order to reproduce it. Questions must include the desired behavior, a specific problem or error and the shortest code necessary to reproduce it in the question itself. If the question consist very long error, then it's useful to attach the screenshot (to get the whole context) as far as you re-type the main relevant error into the post. Help: What topics can I ask about here? Not the answer you're looking for? Browse other questions tagged support code-formatting images . Why did my IDE related question get downvoted/flagged? Are **edits** which `decorate` the post with > markdown good? Should I review questions with images of code as “looks ok” or “requires editing”? Why can't users with less than 10 reputation points add images while asking question? Using copy-paste to upload images in Firefox? Did Stack Exchange change the upload host for images?